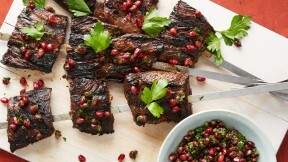 This pomegranate skirt steak kebabs recipe appears in the "Kebabs" episode of Martha Stewart's Cooking School. Make the pomegranate and parsley relish: In a medium bowl, stir to combine pomegranate seeds, parsley, lime zest and juice, and oil. Season with salt and pepper; set aside. Make the kebabs: In a medium bowl, whisk to combine pomegranate molasses, honey, mustard, oil, 2 teaspoons salt, and 1/2 teaspoon pepper. Coat steak with marinade, cover, and let marinate for 1 hour at room temperature or up to overnight in the refrigerator. Preheat grill or grill pan to medium-high. Thread steak onto three 12-inch (30-centimeter) metal skewers and season with salt and pepper. Grill kebabs until charred and cooked through, 3 to 4 minutes per side. Let rest 5 minutes before slicing. Spoon pomegranate and parsley relish over sliced steak.